Con season is once more! upon us! Its safe to say that here at PowerCore we are addicted to the electric energy and exuberance that can only be found at conventions. We will be participating at several conventions in the coming weeks – here is the rundown of where we will be. Be on the look out for Connie – the official PowerCore Convention mascot – and the rest of the PowerCore crew . 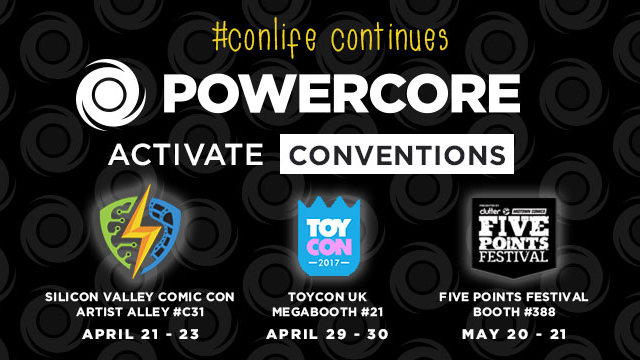 We will have lots of cool merchandise, limited edition Art Toys and as always we will be showing off the cool connections between Toys and Digital Experiences that the only the PowerCore Activation Platform can deliver. And as always watch the PowerCore Instagram feed for sneak peeks and live reports. The PowerCore table will chockful limited edition Martin Hsu plushies and art, UDON Collectibles merchandise, a limited selection of Mechatro WeGo toys plus PuzzleCore demonstrations. York Leisure Hall, Bethnal Green, London, U.K.
ToyCon UK is the UK’s only dedicated designer toy convention, It’s run by toy fans for toy fans! 2017, is a big milestone for the show, it’s 5th anniversary! To mark the occasion, ToyCon UK will be bigger and better than ever as a 2 day event. PowerCore has launched a special set of Messaging Stickers especially for the show. Download our COLLECTOR app and start using them today! We will also be bringing the next installment of the Mechatro WeGo Custom Show featuring some new additions to the show especially for ToyCon. We will also have some more surprise announcements to come! The Five Points Festival is a collision of toys, comics, and counterculture curated by Clutter Magazine and presented by Midtown Comics. A designer toy and comic convention in New York’s Lower East Side. PowerCore will be also be bringing the Mechatro WeGo Custom Show to the brand new Five Points Festival in New York City. Stay tuned for more details.